Scouring the web for an appropriate, durable, and quality angle grinder is certainly a more daunting task than you may have initially anticipated. Not only is there a considerable number of models available but each of these models offers a range of unique features that all seem to benefit the user. Examining each model would be somewhat time-consuming and simply overwhelming, so this article aims to provide a clear overview of one of the more popular models currently available, which is the Makita XAG03Z. By the end, you should have a clear understanding of what this unit has to offer plus, whether it’s a good fit for you or not. Dating back to 1915, Makita originated as a small repair shop in Nagoya, Japan. It is amongst the true leaders when it comes to power tool innovation, as they produced the world’s first petrol-based, one-person chainsaw in 1952 before moving onto Japan’s first electric planers in 1958; this is when they moved into the electrical power tool powerhouse industry that we know them as today. Today, Makita has gone on to establish their brand in over 35 different countries. The Makita XAG03Z is yet another of their well thought out, and quality tool that offers both versatility and functionality to the user. This angle grinder has been designed to bridge the gap between household and industrial use. The Makita XAG03Z is a cordless, battery-operated angle grinder, making it ideal for those who are always on the move or need a reliable angle grinder that doesn’t require a constant power supply. Weighing only six pounds, this model is light enough to be carried around to a worksite for a a prolonged period but still having enough weight behind it to feel stable during use. Despite it requiring only an 18V battery, it has an RPM of 8,500, making it an efficient cutting and grinding tool especially as it can support discs up to 125mm. This allows for a variety of different discs to be applied to allow the grinder to take on a wealth of various tasks. This product is sold as a tool only, which means that you have to buy the battery separately as well as other accessories such as a case if you need one. ​​Requires an 18V Lithium-ion battery: This tool is portable and convenient as it is powered by a battery, which, as mentioned, you need to purchase. Nonetheless, being loaded with an 18V battery makes it great for home or light industrial use. Provides enough speed: With an 8,500 RPM disc speed, this tool creates a smooth and effortless cut or efficient surface grinding. Lightweight and stable: Weighing less than 10 pounds, users are met with a model that offers great stability and control while also being light enough to carry around for long periods of time. User-Friendly: Integrated with an ergonomic handle and grip, this is very comfortable to use during operation. Also, its automatic speed change technology allows the user to adjust the speed and torque just by applying pressure. Long-lasting battery and motor: Brushless motor rids the need for carbon brushes, allowing the motor to run at a colder temperature; therefore, increases its life expectancy. The brushless motor also extends the battery life to 50% longer per charge. All angle grinders should be operated with the utmost care as even the household models are still heavy-duty power tools and not following adequate safety precautions could lead to injury. The most impactful steps you can take to increase your level of safety while using the Makita XAG03Z is to wear both a full-face mask and gloves to protect against metals sparks or wood splints. When it comes to handling the angle grinder, you’ll want to adopt a strong yet agile stance that’ll allow you to quickly adjust your position so that you can quickly move with the grinder to produce smoother and more efficient cuts. Cutting at 90º perpendicular to the object that you’re cutting will also drastically reduce the chance of any slippages. It’s also good practice to have a variety of disc types available so that after cutting or grinding an item, you’ll be able to smoothen the surface, which will either prevent any potential injuries or prepare the area for the next step of the process. If you’re looking to stay with Makita, but you’re looking for something with a bit more power, then perhaps you should consider turning away from battery operated grinders and look into corded models. 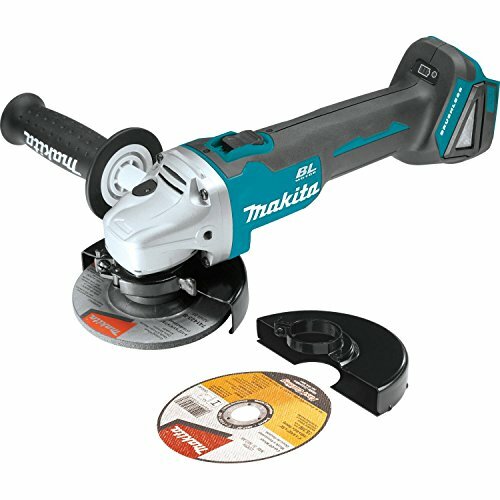 The Makita GA7021 7-inch Angle Grinder comes with a 15.0 amp motor, which is capable of producing 6,000 RPM. This grinder is built for heavy-duty cutting and would be a fantastic choice for more industrial uses. For those who simply can’t do without the convenience that is offered by a battery powered angle grinder but fancy trying a different brand, then you might want to look at Dewalt DCG413B 20V. Offering a speed of 9,000 RPM produced by a brushless motor, you’ll subsequently benefit from longer battery life and more efficient performance. The Makita XAG03Z is a great angle grinder that can easily cope with a variety of jobs. While it is exceptionally well-suited to household use, it’ll certainly be able to hold its own in the contracting tool environment. While Makita discontinued selling this product, this model is still regularly available due to its popularity and is definitely worth the investment if you’re searching for a versatile and reliable angle grinder.